The story is familiar and the media writes about it the same way. A mass shooting and the shooter has anger control problems, social problems, and finally probable symptoms of psychosis. The "ELF" considerations here were interesting. ELF is extremely low frequency as specified in this Wiki primer that covers most of the relevant facts. I grew up about 30 miles away from the original ELF site in Clam Lake, Wisconsin and there were plenty of conspiracy theories and environmental concerns right in the area at the time that surrounded this project including the effect of ELF on the residents. The usual interviews with politicians about gun access and psychiatrists about whether or not violence can be predicted. It is a very familiar sequence of events. The White House is less vocal this time because I think everyone realizes that the government has no interest in solving the problem. You can click on mass homicide and mass shooting and see my previous posts on the matter for a more complete elaboration. There seems to be nothing new in the response to this mass shooting other than the question of security at American military installations. 1. Mass homicide is a public health problem that can be addressed with public health interventions. 2. Violence and homicide prevention can occur even in the absence of firearm legislation. 3. Violence and homicide prevention does not require prediction of future events but the capacity to recognize markers of violence and psychiatric disorders and respond to them appropriately. 4. There need to be accessible speciality programs for the safe assessment and treatment of people with severe mental illnesses and aggressive behavior. That includes the assessment of threats since they are the precursors to the actual violence. 5. A standardized legal approach to the problem of the potentially dangerous person and whether or not mental illness is a factor is necessary. 6. A comprehensive policy that addresses the issues of progressively inadequate mental health funding is necessary to reverse these trends will provide the funding. All of the above elements require a standardized approach to the care of the aggressive person and there are several clear reasons why that does not happen. The so-called mental health systems is fragmented and it has been for decades. It is basically designed to ration rather than provide care. That is a massive conflict of interest. Until that is acknowledged by the politicians and advocates nothing will be accomplished. It is very hard for politicians to acknowledge when they are backing a national agency that essentially endorses rationing and managed care. You can also compare my writing and suggested solutions to this problem to a recent "call to action" by American Psychiatric Association President Jeffrey A. Lieberman, MD. How many "calls to action" does the APA need? "#2: I do not consider recording and mixing to be unrelated tasks which can be performed by specialists with no continuous involvement. 99 percent of the sound of a record should be established while the basic take is recorded. Your experiences are specific to your records; but in my experience, remixing has never solved any problems that actually existed, only imaginary ones. I do not like remixing other engineer's recordings, and I do not like recording things for someone to remix. I have never been satisfied with either version of that methodology......"
This letter does contain the rough language that you would expect to hear from young men before they recognize the value of language that never needs to be censored, but there are potentially important lessons. I have had the privilege of talking with people in considerable detail about their medical, psychiatric, social and family histories since about 1978. That is a long time by anybody's standard. There are some things that jump out of those interviews that seem to not change over time. I am always surprised by the implicit rather than explicit agreements between physicians and their patients. That is especially true since managed care companies started dictating the practice parameters of their physician employees on a large scale basis. I wonder if things might be a lot better if the relationship between a doctor and his/her patient was not spelled out as clearly as the letter from this sound engineer. I thought I would compose a parallel letter. It might go something like this . That is my first attempt to write a letter about what you might expect in seeing me for psychiatric treatment. I intentionally wrote it in a manner similar to Steve Albini when he described what it might be like to employ him as a sound engineer. The whole idea of being very clear with people about what they can expect and how they need to interact with psychiatrists in treatment has never been more critical. For all of my career (so far) I have been an employee of a healthcare organization. In that situation that adds a dimension to the treatment contract. For example, do the organization that employs you have the same priorities and the same approach to patient care? If not, it might be very difficult for you to pen a sample letter like the one I have written. You can't really talk about psychotherapy or even lengthy evaluations if your organization allows you to see patients in 10-20 minute appointments to refill their medications. I am very interested in hearing what other psychiatrists would add or subtract to what I have so far. I would also be interested in hearing about any existing letters. I think they would also be very useful for psychiatrists starting out of residency or psychiatrists going into private practice after years of working as an employee. One of my colleagues posted this NYTimes reference to my Facebook feed this morning. It is written by anthropologist T.M. Luhrmann. She has a number of references in Medline relevant to this article. Her basic thesis is that violent or aggressive auditory hallucinations experienced by people with psychotic disorders are culturally determined. She concludes with the irony that the cultural factors responsible for a lack of will to initiate any meaningful gun control measures may be responsible for more violent auditory hallucinations than are experienced in other cultures. What is the evidence? She sites a cross cultural study of 40 people with schizophrenia in India and the United States. Across cultures the horrible voice in India were focused on sexual themes and in the US they were focused more on aggression and torture. There were other directive voices focused on routine directions. Not a lot of detail. As a guy who has talked with hundreds of people who were experiencing voices - the common ones are basically background noise like people mumbling or talking at a volume that cannot be understood. Clearer voices clearly comment on the person experiencing them. The comments can vary from routine such as what the person is doing to very negative commentary or ridiculing them. At the extremes voices tell people to harm themselves or others or commit suicide. Those are the typical voices that psychiatrists are trained to ask about for the purpose of assessing dangerousness, but recent studies show that they are probably poor predictors of actual violent acts in clinical settings. What about the larger observation that voices would incorporate culturally relevant elements? It seems to me that would be a given. As I considered the problem I recalled reading J. Allan Hobson's book The Dreaming Brain when it first came out. He describes acquiring the dream journal of the Engine Man who recorded his dreams in great detail and without interpretation in 1939. 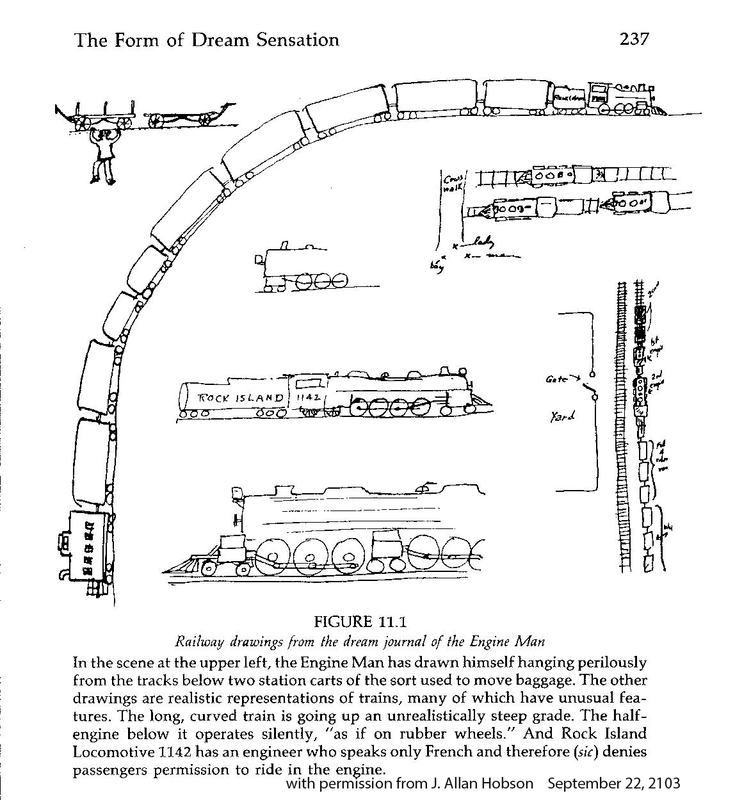 The Engine Man was "fascinated by railway trains" and the content of his dreams that he describes and draws contains a lot of that subject material. Railway trains were the technology of the day. They were part of the culture and the conscious states of me interested in technology. Like the Engine Man it is difficult to conceive of a person experiencing voices or delusions without a cultural context. It is difficult to imagine scenarios that lead to voices de novo without exposure to a plausible or even science fiction origin. Hence the common scenario that there is an agency projecting these voices as the most likely cause. It can also imply motivation for the perceptual changes as well as the content. I doubt that voices originating as a beam from the police, the CIA, the FBI or Homeland Security occurred before these agencies were invented. The other association I had is the theory (or axiom) that the prognosis of schizophrenia is much better in the developing world. This idea came about as the result of a number of World Health Organization Studies and others done in the 1970s to 2000s. Those studies suggest a better prognosis for schizophrenia in the developing world. That theory has been called into question based on methodological considerations by Cohen et al. At the anthropological level, the argument by Dr. Luhrmann reminds me of a similar argument about whether or not primitive peoples were inherently peaceful and became aggressive only after being influenced by social organization. Large scale warfare only becomes possible as the institutions of civilized society grow. Primitive man by nature was inherently peaceful and would get involved only in small scale conflicts around issues like marriage and property. Kealy refers to this as the Myth of the Peaceful Savage. He dispels that myth in his book War Before Civilization and points out that prehistoric man was as aggressive and violent as modern man. Violent and aggressive solutions appear to be universal and it is likely that the culture in America is no more violent than what people experience across the world. The only plausible cultural argument that is rapidly vanishing is the exposure to media violence on a 24/7 basis. At anthropological level, the basic question seems to be why all human societies seem to regard warfare and aggression as an ultimate solution to unresolved conflict. The larger issue of course is the fact that the experience of hearing voices is much more than that. The entire conscious state is affected. There is not a linear sequence of events that proceeds form a voice to an action. Practically everyone with that experience has a substantial change in their conscious state. The usual stream of consciousness is affected as well as mood state and decision making biases. At times that is detected there can be what appears to be a complete change in the personality of the affected person. The decisions that they currently make cannot be predicted by your past experience with them. There are several psychotherapeutic approaches to the problem. From a psychiatrist's perspective is is generally necessary and advisable to discuss the voices at some level with the patient. An explanation is necessary that is more than an incomplete biological one as: "You are hearing voices - take this medication and it will get rid of them." Most people are interested in what it means and culturally and individually based meanings are often useful. Some of the preliminary cognitive behavioral therapy of hallucinations emphasizes the need to decrease personal meaning and when that occurs the voices may become less intense and disappear. It should really come as no surprise that talking about voices in certain ways modifies the experience of hearing them or even results in them disappearing. I would liken it to making a conscious decision to wake up during a dream that you don't want to have and then realizing that the dream is gone. Although it has not been investigated I would speculate that this ability would be proportional to the degree that a person's usual conscious state has been affected. Hobson JA. The Dreaming Brain. Basic Books, Inc. New York, 1988. TM Luhrmann. The Violence in Our Heads. New York Times September 19, 2013. Cohen A, Patel V, Thara R, Gureje O. Questioning an axiom: better prognosis for schizophrenia in the developing world? Schizophr Bull. 2008 Mar;34(2):229-44. Epub 2007 Sep 28. Review. PubMed PMID: 17905787; PubMed Central PMCID: PMC2632419. Kleinman A. Commentary on Alex Cohen et al: "Questioning an axiom: better prognosis for schizophrenia in the developing world". Schizophr Bull. 2008 Mar;34(2):249-50. Epub 2007 Dec 3. PubMed PMID: 18056682; PubMed Central PMCID: PMC2632393. Keeley LH. War Before Civilization - The Myth of the Peaceful Savage. Oxford University Press, 1996. I finished reading E. Fuller Torrey's recently released book American Psychosis - How the Federal Government Destroyed the Mental Illness Treatment System . I recommended it on the basis of a a quick initial read of a brief section on managed care but can provide additional details at this time. I will start with the conclusion. Criticizing an expensive, fragmented, and poorly conceived system of care for severe mental illness is a fairly easy task for any psychiatrist who tries to provide care for the target population of people with schizophrenia, bipolar disorder and severe mood disorders. This book concentrates many of the references about deinstitutionalization, incarceration of the mentally ill, victimization of the mentally ill, and aggression and violence by the mentally ill in one place. In the conclusion Dr. Torrey also recommends some 10 potential solutions to the problems and more importantly suggests the some of these need to be implemented on a small scale rather system wide. "For profit funding of of public mental illness services has been tried and it does not work." This is the real experience of anyone who has worked in psychiatric acute care and by that I mean the hospital in your community where people are brought in by the police on emergency holds. Even in that setting there are levels of acuity. In a metropolitan area there may be 8 or 10 psychiatric inpatient units but only one or two of them will accept patients with high levels of aggression or suicidal behavior. In an ideal world these would be units where there are staff with high levels of expertise in treating these severe conditions, but the reality is that economic considerations are at the top of the list. There needs to be adequate staffing for close supervision and the staff have to be able to deal with high levels of aggression toward self or others. There also needs to be expertise in recognizing and treating alcohol and drug intoxication and withdrawal states. There is usually minimal attention paid to the therapeutic aspects of the environment. When I first started working in that environment it was the late 1980s. I had just completed a three year stint as the medical director of a very good community mental health clinic that offered case management and Assertive Community Treatment. I was well trained in community psychiatry at the University of Wisconsin Psychiatry Department and it was good to actually practice it with a team of highly motivated people. The first months on the inpatient unit resulted in several "denials" by insurance company intermediaries functioning to ration care. Keep in mind that all of these patients were in the highest acuity unit in the hospital, had problems with suicidal and aggressive behavior, and many needed detoxification. The rationale of the "peer reviewers" was the the patient did not require acute care or the care could be provided at a less intensive facility. Apart from county detox facilities that had policies against admitting suicidal or aggressive patients - no less intensive facilities existed. When you are in that environment trying to provide care, it is pretty obvious that this peer review process is basically an insurance company game to make money. In the small print in the denial letters there was an option to appeal all denials to an administrative law judge within the state. I asked my colleagues and nobody had tried that route. I collected 12 denials and requested a hearing in front of the administrative law judge. I took a day of vacation to go to court. A week before the hearing I was informed that my hearing was cancelled and the administrative law judge decided in favor of the insurance company. I appealed to the Attorney General on the basis of conflict of interest stating that the peer reviewers worked for a competing organization and therefore this was anticompetitive activity. The AG informed me that they were independent contractors. How can you be an independent contractor if you collect a paycheck from the organization that is denying care by your competitor? It was clear to me that the state government was very friendly to the managed care industry. The whole managed care strategy for rationing care or in extreme cases shutting down entire psychiatric units was outlined in my previous post on overutilization. It is the basic money making strategy of managed care organizations. It essentially doubles down on rationing. That occurs because hospitals are paid a set amount for taking care of people regardless of how long they are there and that amount is denied in as many as 10% of cases. If there is one deficiency of this book it is a lack of granularity on this issue. Dr. Torrey approaches the problem as a top down problem of policy deficiency, driven by an ideology that bed capacity could be shut down and not missed either because of the toxicity of state hospital settings or too much faith in the federal initiated community mental health movement. Assuming that a patient can actually get the level of acute care that they need without being thrown out of the hospital by an insurance company, the fragmentation of care does not stop there. Even though insurance companies say they are emphasizing outpatient care, getting an appointment may be impossible. The prescribed medications may be denied. Housing options or community case management for people with severe mental illness are not usually available unless the insurance changes to a public option. American Psychosis covers the funding and policy issues on a global level before it gets to the suggested solutions. Excellent examples are given to illustrate these points. For example, North Carolina is given as the example of what happens when a state mental health system is privatized (p 158). The parameters of the dramatic deterioration in services that resulted from this maneuver is a well documented example of what happens when a for-profit entity begins to manage care and shift the responsibility for care of serious mental illnesses to the correctional system. American Psychosis is a well organized analysis of the problems that occurred as the result of an initiative in the Kennedy administration. It contains a lot of information and references about what has happened as the result of these decisions. There is also a subtext and that is it is written from the perspective of a psychiatrist who has been a thought leader on the issue of treating people with severe mental illness. Only a minority of people in the United States understand that perspective and I think that there will be predictable backlash from the constituencies that believe a severe mental illness is a preferred state and that everyone should have the right to enjoy it. That is not the experience of any acute care psychiatrist and Dr. Torrey presents that perspective very well. I was out of town at a Mayo Clinic seminar and while I was gone, Amazon sent me an e-mail. My copy of American Psychosis - How the Federal Government Destroyed the Mental Illness Treatment System by E. Fuller Torrey had shipped. This is the only book I have really been eager to read for some time. The title is almost exactly what I have been saying for the past 25 years. At last I had somebody who was finally seeing the real problems with the treatment of mental illness in this country. After putting up with obnoxious blogs about how psychiatrists had been bought and paid for by drug companies, manufacturing catastrophes designed by psychiatrists like the recent DSM-5 apocalypse, and an endless number of side shows I was looking for an anchor point that looked at the real problems and what to do about them. For the purpose of this post I was interested in one thing. What did Dr. Torrey say about managed care? As any reader here should know by now I view managed care as the single worst thing (by far) that has happened to psychiatric care and the treatment of severe mental illness in the United States. Managed care tactics are responsible for decimating psychiatric care, especially hospital based care. Managed care has destroyed psychotherapy and removed practically all of the creativity and innovation from mental health care. Managed care has rationed both access and treatment resources to my patients who have few resources themselves. In order for this book to impress me, it would need to say something about managed care. Turning to the index there were exactly two pages about "managed care organizations". What exactly did Dr. Torrey say? The introduction to the section is introducing Medicaid as "the largest single fiscal impediment to improving services for mentally ill persons in the United States." The system is gamed by the states to optimize Medicaid reimbursement by the federal government. The example given is the IMD (institute for mental disease) exclusion that disallows Medicaid reimbursement for state hospitals. The states responded by closing down state hospitals and shifting admissions to Medicaid covered acute care settings in community hospitals. According to Torrey cost shifting based on Medicaid has been the driving force behind public services for 40 years. Managed care enters the picture in paragraph 2: "At least 34 states deliver 'some or all mental health services through managed care arrangements, including care outs and comprehensive managed care organizations (MCOs). States such as California, Utah, Colorado, Pennsylvania, New York, and Massachusetts have used capitation funding, under which providers are paid a fixed amount to deliver all necessary services." Throw Minnesota in there. And also throw in the idea that practically all states ration using managed care strategies to save money - even if there is no formal contract with an MCO. 1. The priority is cost savings and not patient care. Yes! Managed care has nothing to do with increased access or quality. It is all about rationing access to care including access to medications necessary to treat severe mental illness. There is a reference from the NEJM from 1994 that illustrates that rationing these medications has an unfair impact on patient with severe mental illness and increases overall costs but the industry continued the practice unabated despite that study. Cost savings after all is just a politically correct way to designate profits for the MCO. After all, nobody ever realizes any savings in health care it just ends up on the bottom line of the MCO, the pharmaceutical company or the provider. 2. The sickest patients suffer the most under managed care rationing. Yes! It should be fairly obvious that if you move the group of patients with the most severe problems at a high rate into a rationed system, they are getting proportionately less resources than the severely disabled of any disease category. Dr. Torrey points out that individuals with severe mental illness represent only 11% of all Medicaid beneficiaries but they are 1/3 of all of the high cost beneficiaries. 3. This is a very profitable segment for managed care companies. Yes! The example given in the book is United Behavioral Health and their claim to 'oversee behavioral health benefits for more than 23 million beneficiaries' including Medicaid patients. He goes on to illustrate the the difference in outcomes for executives of these companies and the mentally ill whose benefits they oversee and points out that the difference in patient outcomes is directly related to that disparity. (see par 19). He goes on to conclude that the PPACA (aka Obamacare) will change nothing basically because: "It is likely to lead managed care companies finding new and creative ways to not provide services to mentally ill individuals who need the services the most." Talk about innovation. I could not have said it better myself, but have said it in a number of ways in the past 20 years. I plan to continue to read and analyze this book. I have already purchased it and can certify that the managed care section is accurate if brief. Any objective observer realizes that the government paying the managed care industry for not providing services is the central problem with the provision of treatment to persons with the most severe forms of mental illness. These days it also extends to more common anxiety and depressive disorders treated in a primary care clinic and diagnosed by a very brief screening. Keep that in mind when you are reading the latest trivia about the DSM, the pharmaceutical industry involvement with psychiatry, debates about clinical trials data for FDA approval, or any number of psychiatric non events that are furiously debated around the Internet. Tax dollars given to an industry to ration services is money that should have gone to provide services to the mentally ill.
As I read through these warnings I have several associations. First off, physicians were told 12 years ago in JAMA that they were undertreating pain, misunderstood pain, and that pain treatment needed to change. That was a naive document that depended on an assumption that pain could be "quantitated" on a 10 point scale. Over a decade and 100,000 opioid overdose deaths later we are not told that providing this information on drug labels will make a difference. That leads me to my second association, there is nothing in the above warning that I didn't learn in medical school 30 years ago, including the risk of neonatal withdrawal. The third association is that this definition and intervention is almost completely naive about addiction. A person with an addiction does not care about dire warnings. They don't care about their pain ratings. They care about acquiring and using addictive drugs. It is the nature of addiction. Their entire conscious state has changed. The tendency toward opiate addiction or not is probably biologically determined and a doctor cannot predict who is at risk. If you take an initial dose of opiate and experience intense euphoria, high energy and productivity, and intense sense of well being or feel like you finally have become the person you always wanted to be - you may be a person at high risk for opiate addiction. It doesn't really matter if they have a chronic pain disorder. 1. Opioids are a silver bullet and will eliminate chronic pain if the dose is high enough. 2. Once a maintenance dose is achieved the level of pain relief should be constant. 3. Opioids are only taken for primary gain - the analgesic effect or the elimination of pain. 4. Opiates - prescribed by a doctor will not lead to reactivation of a previous addiction. What do people need to know now? Probably not the new package insert for opioids. Most physicians don't read it. Every person taking an opioid need to know that it can affect their subjective state in such a way that it will place them at risk for addiction. They need to know at that time that they need to contact their physician and discuss it and the possibility of alternate or more closely monitored treatment. They need to know that there is no medicine that will treat chronic pain into remission. Physicians need to know a number of things including the fact that there is no medication that will eliminate chronic pain. They also need to know that it takes time and detailed evaluations (calls to pharmacy, tox screens, limited prescriptions, assessment of functional capacity) to optimize treatment and prevent addiction. The warning on a package insert from the FDA containing seriously dated information will not do it. Dire warnings about an epidemic won't do it. National Behavioral Health Quality Framework - Ultimate Oxymoron? As I pointed out in a previous post, the Substance Abuse and Mental Health Services Administration (SAMHSA) a branch of the U.S. Department of Health and Human Services is currently working with the managed care industry. They are also the object of criticism by E. Fuller Torrey in his recent editorial and upcoming book for promoting non evidence based care of people with severe mental illnesses and in fact at many levels dismantling existing care. With that kind of a backdrop, their e-mail to me this morning suggesting that I should review the National Behavioral Health Quality Framework (NBHQF) and provide comments as an interested member of the public should not have been very surprising. I thought I would put that commentary here rather than letting it be buried on a government website that nobody would read. To set the appropriate tone for my comments, the introduction section of this document identifies the major entity that the government is working with here as the managed care industry. I consider the NCQA (or NQF) to be a proxy for the managed care industry. That is their history as I recall it and I am not aware of any physician professional group that says otherwise. In fact, I cannot find the American Psychiatric Association as a member of the NQF, but I am fairly certain that they used to be a member of NCQA..
Getting back to the document - six goals are identified with a page each dedicated to currently available measures and a second page that is described as "future targeted measures that are deemed important to advancing the behavioral health quality measurement." An example of what that involves is illustrated in "NBHQF Goal 1: Effective - Promote the most effective prevention, treatment, and recovery practices for behavioral health disorders." Not to be too much of a stickler here, but I don't really know what a "behavioral health disorder" is. The most precise definition would be "whatever mental or psychiatric disorder that a managed care company has decided that they will pay for". Behavioral health is basically a business term with no medical or psychological meaning. As far as I can tell, it was designed to disenfranchise psychiatrists and other mental health providers and yet the rationale for denying treatment was always proprietary "medical necessity" criteria. Moving beyond that we basically see a number of screening interventions for "Provider/Practitioners", a number of completely unproven interventions and quality markers, and at least 30% of the cells in the matrix are left "intentionally blank". What exactly is there to comment on? In the second page "payers using payment incentives to increase the use of EBP (evidence based practices)" is actually considered a quality marker. That is a conflict of interest much greater than any pharmaceutical company scandal. To translate, that means that managed care companies nation wide have another way to deny payment and save money based on what they consider to be an "evidence based practice." but they are rationalizing it as a quality marker. Let me suggest how the depression assessment and screening should be done in this matrix. First of all the screening test in this case the PHQ-9 does need to be validated as a diagnostic and outcome measure in populations. The current literature is extremely limited and there is no evidence that population screening for depression accomplished anything other than exposing a lot of people to antidepressants that the FDA has identified as potentially arrhythmogenic. The cost of prescribing SSRIs to a large population as well as the electrocardiogram abnormalities is unknown. I will briefly comment on the additional goals. "Goal 2: Person-Centered Care". As previously explained, this is the goal of every physician who has ever been trained in medical school. It appears here basically as rhetoric that is designed to disenfranchise professionals and make it seem like managed care companies invented individualized care. "Goal 3: Encourage effective coordination within behavioral health". What jumps out of the page at me under this sparsely populated matrix is "Ratio of detox to outpatient admissions". It is well known that managed care tactics have essentially destroyed the availability of medical detox in most communities. I can recall being told that medical detox was not "medically necessary" by managed care reviewers. I guess the hope was that the cost of detox could be transferred from managed care companies to non-medical county facilities. Quality care for addictions means that there needs to be a spectrum of care. I don't know what ratio is implied by this quality marker but I can assure you that it will favor managed care companies. "Goal 5: SAFE - make behavioral health care safer." Suicide, injury and death, treatment for overdoses after hospitalization, and discharges on multiple antipsychotic drugs are suggested as quality markers. There is no evidence of what it takes to make the assessment and treatment. To capture any problems in these areas you need a quality process, not a piecemeal check box that can be gamed so that it appears that you are providing quality care. Measuring these variables in the absence of defining a quality process is meaningless. "Goal 6: Affordable/Accessible: Foster affordable high quality behavioral health care...". This continues to be an absurd priority of the partnership between the government and the managed care system. There is no more "cost effective" approach than what passes for behavioral health care. Mental health treatment in the US has been decimated by 20 years of managed care to the point it is practically non-existent. During that same time there has been an addition of trillions of dollars in Cardiology, Intensive Care, and Oncology infrastructure. Even if that were not true, what is the evidence that cost effectiveness has to do with quality? It is certainly not reflected in the previous specialties that I just listed. 1. Administrative data - administrators have significant biases that seem to impact on so called quality markers across the board. They don't seem to understand their biases and the major biases include not really knowing anything about medical quality, thinking that medical quality can be derived from what is basically administrative data (length of stay, readmissions, etc.) and at this point in time having so much political leverage from government backing that they don't really have to pay attention to the considerable number of people out there who know a lot more about quality. As I have documented on this blog this is a thirty year trend and all of that is captured in the NBHQF. Any who has followed quality markers over the last two decades will probably have made the observation that business heavy entities like managed care systems are information averse. By that - I mean that they collect a large amount of data but it is really not enough data or the right data. Great examples are HEDIS data and PHQ-9 scores. Is it really possible to collapse medical quality in to what are really simplified demographic parameters? No more than knowing that 50% of 85 year old men have coronary artery disease. 2. Business practices trumping medical practice - on this blog I have also reviewed these practices and will focus on one this glares in this report - "person-centered care". For years HMOs and their administrators were focused on "population based care". They scoffed at the notion that people or patients needed to be treated on an individual basis. This was at the peak time when they were deciding that everyone with a certain condition should be hospitalized for a the same number of days and it was a "quality problem" if the length of stay in the hospital was too long. Nobody ever complained if the length of stay was too short. Many of the thought leaders in managed care go to that position by basically promoting these ideas. Why is the managed care industry suddenly behind "person centered care". You won't see the history recorded anywhere but a lot of it goes back to the primary care physician as gatekeeper. If you assume that you can managed populations of people with the same interventions, you can tell your subscribers that they have to get "referrals" from their primary care physician for any tests or consultations that are viewed outside of the population norm. This was happening on a large scale in the 1980s and 1990s but subscribers rebelled against it. After all they were paying good money for insurance coverage and not seeing it back in what they were interested in for health care. The gatekeeper function disappeared and suddenly even managed care subscribers could directly seek consultations and referrals that they were interested in. Patient centered care from the managed care industry was basically determined by the market and the failed theory of their thought leaders about managing populations rather than treating individual people. Physicians have always been taught that patient care is highly individualized. The question is will they continue to let the government, business entities, and non-evidence based practices masquerade as quality. Looking at the quality of physician commentary in the media, in journals, and on blogs is not very hopeful. It is clear that physicians would prefer to blame themselves or one up one another rather than look at the true problems with the health care system and what bureaucrats and businessmen are calling quality. As anyone reading the newspapers has heard, the DSM-5 went on sale earlier this year amidst a cacophony of DSM bashing and bashing of the profession in general. The most vehement critics also exhorted the public to not buy this evil book that would lead to the squandering of billions of healthcare dollars and leave millions hopelessly misdiagnosed and taking expensive unnecessary drugs. In some cases that I have recorded on this blog the criticism was even more extreme. Now that the DSM-5 has been out for several months I asked myself what the outcome of all of that bad press has been? Like thousands of my colleagues, I have picked up a copy and glanced at it from time to time. It certainly has not lead to any revolution in psychiatric practice or changed anyone's clinical interviewing or diagnostic process. In fact I have talked with many psychiatrists in the past several months and none of my conversations has touched on the DSM-5. What are the facts of the release after all of the pre-release spin? First of all, the predicted apocalypse has not happened. I should say the apocalypse happened but it was 30 years ago when the managed care industry essentially converted mental illness into "behavioral health" and began to restrict access to psychiatric care, inpatient and medical care, psychotherapy, and certain medications to people with severe mental illnesses. The predicted apocalypse in response to the DSM-5 did not happen because as I have been saying all along, the DSM has never been the problem. Mental health care can be denied as easily on the basis of a DSM-5 diagnosis as a DSM-IV diagnosis. A diagnostic manual is partially relevant only for people who are trained to use it. That said, is there any way to estimate whether people are buying it or not? I heard a sales estimate e-mailed by a colleague that suggested brisk sales, but did not have permission to quote him so I started to look for public sources of data on DSM-5 sales. I went to the usual New York Times Bestseller List and could not find it listed. I could not really find any academic books listed there so I wonder if there is not another list. I thought that Amazon would be the next logical stopping point and I did find some data there. I was looking for data in number of units actually sold and I could only find that as proprietary data that somebody would sell to me. I did find it as # 8 in Best Sellers of 2013 so far. This link shows it has been in the Top 100 books for 167 days but that it has fallen to the number 4 position. Interestingly the Publication Manual of the American Psychological Association had been on the same list 8 times as long. I also found it in a sequential list of DSM-5 products and related variants including 2 books about the DSM-5 by Allen Frances, MD. It made me think about obvious conflict of interest considerations in the psychiatry criticism industry that are never mentioned when they get free press. If somebody can suggest that I have been getting a free lunch from a pharmaceutical company when I haven't seen a drug rep in over 25 years, they should at least point out that somebody can currently make money - possibly even a good amount of money by criticizing psychiatry regardless of whether or not that criticism is remotely accurate. That is all I have so far. If you have reliable public data on the actual sales of this manual and would like me to post it here, please send me the information. I have requested the actual sales figures in an APA forum but I doubt that anyone will provide them to me. The APA is a very conservative organization and I doubt that they would want you to see those sales figures posted here, even if if this is probably the only public forum that takes a very skeptical look at all of the critics of the DSM-5 and psychiatry in general. I came across this poem as part of the Breaking Bad series on AMC. It applies to their plot line, but it is also a testament to grandiosity as a reaction to the existential concerns about death and meaningfulness. As I drove in to work this morning I thought about the fact that the physical monuments to people, especially the ones that are personally erected in one's own honor rarely stand the test of time. There is imagery at several levels in the poem from the archaeological to the psychological and the impact that culture has on that psychology. Thoughts, ideas, and deeds are the best way to be remembered. And the people who are remembered in this way would not be interested in monuments in their honor. A good example is the focus on Shelley's poem nearly 200 years after it was originally published. Should existential themes be important to a psychiatrist? I answered that question for myself over 20 years ago when I picked up a copy of Yalom's Existential Psychotherapy. At that time I was working in a pediatric setting and talking with residents and staff who actually seemed interested in talking with a prospective psychiatrist. Two of the physicians in the group had the rare experience of seeing motorcycle accidents on the freeway and being first responders and saving the crash victims. We discussed Yalom's conceptualization of death anxiety and how it might apply and it made sense to both of them. Since then I have found it much easier to talk about these themes when they occur rather than trying to elicit specific symptoms since they are very important themes associated with anxiety and depression. The meaning of those symptoms is still important to most people whether that happens from a psychodynamic, cognitive behavioral or existential perspective. And yes - I have recognized the grandiose adaptation to death anxiety and meaningfulness, many times. Bryan Cranston's dramatic read of Ozymandias. The graphics may not mean much unless you have watched the television series. Jim Amos, MD. Did Ozymandias Weep? The Practical Psychosomaticist Blog. Jim Amos has been thinking about this poem a lot longer than me. Read his associations to it at this link. The purpose of this essay is to look at possible boundaries between science and pseudoscience as well as a couple of interesting observations as they apply to psychiatry. One of his key concepts is that the lines of demarcation are not necessarily sharp and the variables are not necessarily linear. He uses the above graph of empirical knowledge versus theoretical understanding as an example. Starting in the upper right corner of the diagram we have hard sciences with particle physics given as the most clear cut hard science. I like to think about my undergraduate chemistry experience as being hard science. Even introductory chemistry exposes the student to an amazing array of facts, observations, and theories that are incredibly accurate. From there, chemistry majors build on their ability to measure specific compounds, synthesize them and study the theory in Physical Chemistry. I don't think that there is any doubt that chemistry as a field is not too far removed from particle physics in terms of empirical knowledge or theoretical understanding. String physics has much theory but is low in terms of empirical support. He refers to evolutionary psychology, scientific history and Search for Extraterrestrial Intelligence (SETI) as a "proto-quasi science" cluster with decreased amounts of theory and empirical support. Other fields like the so-called "soft sciences" of sociology, economics, and psychology have a fair amount of empirical knowledge but less theoretical understanding. The true pseudosciences are in the zone with astrology, HIV denialism, and Intelligent Design. From the history of psychiatry - Freudian psychoanalysis and Adlerian psychology would also be included here but there is also a list of theories from general medicine and surgery that would also qualify. In psychology and psychiatry a central philosophical problem is the so-called hard problem or the explanatory gap between the neurobiology of conscious states and subjective experience. This is exactly where psychiatry resides. A lot of political criticism of psychiatry involves the ability to parse these states and accurately classify different conscious states. 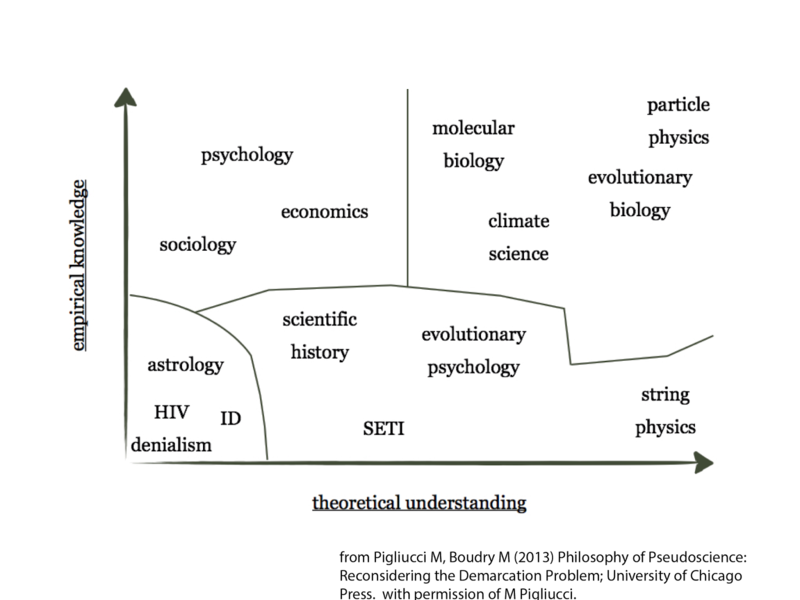 Resolving the hard problem would move psychiatry and psychology firmly to the right in the demarcation diagram but probably not nearly as far as particle physics or maybe not even as far as molecular biology. The relevant question for me of course is where psychiatry fits on the plane of empirical knowledge x theoretical understanding. What about medicine in general? Could we plot a plane of medical and surgical sub specialties on this plane instead of the hard and soft sciences? Does medicine and surgery have theories or practices end up in the same zone as Freudian psychoanalysis. Of course they do. A great example from my days as a medicine intern was highlighted by Ghaemi as "The cult of the Swan-Ganz catheter." In the places where I trained, anyone with moderately serious cardiopulmonary problems was at risk for placement of a Swan-Ganz catheter. The actual person inserting the catheter could be a medicine resident, a cardiologist, or an anesthesiologist. Since the intern is responsible for doing the initial history and physical exam, I witnessed the placement of a large number of these catheters. Once placed they gave an impressive number of parameters on ICU monitors. We were routinely grilled about the meaning of these parameters by attending physicians on rounds. It all seemed very scientific. The cult of the Swan-Ganz catheter was subsequently disproved by randomized clinical trials. This standard of care from the 1980s and 1990s disappeared much faster than Freud. 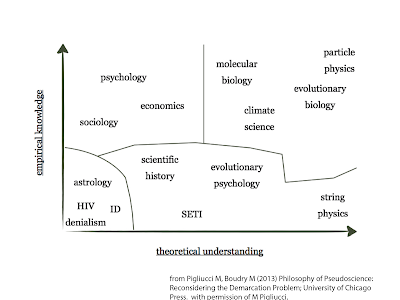 The best way to plot medicine and psychiatry on Pigliucci's empirical knowledge versus theoretical understanding plane would be to consider the clinical basic sciences taught in the first two years of medical school. In my experience that was anatomy, neuroanatomy, histology, microbiology, biochemistry/molecular biology, genetics, pathology, physiology, pharmacology, epidemiology, and statistics. Practically all clinical specialties carry these basic sciences forward in one form or another. The research literature in any particular specialty in full of theory and techniques from these basic sciences. The psychiatric literature cuts across all of the basic sciences in the same way as other specialties. At the minimum, some of psychiatry will be at the level of molecular biology on the diagram in some areas and at the level of psychology in others. Hopefully the unscientific theories will be relegated to the lower left hand corner of the diagram as unscientific and not stand the test of time. I think that Professor Pigliucci's conceptualization is a very useful one. I expect that he will continue to refine these ideas. I think that measurement precision and categorization may be important dimensions to add to these concepts. As Merskey has pointed out both the phone book and the periodic table are much more accurate forms of categorization than any scheme of medical classification. I think that probably says a lot about the underlying scientific dimensions and how measurement is done. Ghaemi SN. A Clinician's Guide to Statistics and Epidemiology in Mental Health. (2009) Cambridge University Press, Cambridge, UK. p. 91. There is an interesting study in the July JAMA Psychiatry on the treatment of first episode psychosis (FEP). The authors conclude that this is the first study that shows major advantages of an antipsychotic discontinuation strategy over maintenance therapy. FEP has always been a topic of interest to me because for 22 years I ran an inpatient unit and about 10% - 20% of the admission were patients with FEP. For the purposes of the study FEP encompassed the diagnoses of schizophrenia, schizophreniform disorder, schizoaffective disorder, brief reactive psychosis, delusional disorder and psychotic disorder not otherwise specified (NOS). There were no diagnoses of mood disorders or organic disorder with psychotic symptoms. Thirty six percent had a comorbid alcohol or substance use disorder. In the original study 7 years earlier, 128 patients were randomized into a DR (dose reduction/discontinuation) and MT(maintenance treatment) arms. A few things are striking as I look at this study. The first is the relatively small N of patient in the study and the diagnostic heterogeneity. In the subgroup analysis at 7 years (Figure 3.) there were a total of 5, 6, 8, and 14 patients in the subgroups. Some of the diagnostic categories imply more chronicity than others. From an experimental standpoint I have concerns about the addition of that last three categories - delusional disorder, brief psychotic disorder, and psychotic disorder-NOS. In my experience, delusional disorder is often not associated with much functional impairment and patients often do not benefit from or want to take any medications. They can be engaged in psychotherapy but maintaining them in therapy is often problematic unless there is an associated crisis in their lives. Brief psychotic disorders also have a good prognosis. I recall presenting data to families concerned about this problem based on a review of what was primarily Scandinavian literature from the 1980s suggesting that up to 50% of patients with a diagnosis of "brief reactive psychosis" experienced remissions. Schizoaffective disorder has similar problems with the manic subtype having a course and prognosis similar to bipolar disorder and the depressive subtype having a course and prognosis similar to schizophrenia. In clinical practice it is extremely common to see bipolar patients misdiagnosed with schizoaffective disorder and I have always wondered how that impacts on the studies of course and prognosis. At any rate, adding these diagnostic categories (31% of the total sample) biases this study toward better outcomes. The dose of haloperidol is interesting. I started to practice inpatient psychiatry in an era of very high dose antipsychotic medication. It did not take long to figure out that this was a bad idea. It also did not take long to look at the basic science behind antipsychotic medication dosing. A key figure in the early days of dopamine receptor pharmacology was Phillip Seeman, PhD who wrote an excellent review in American College of Neuropsychopharmacology's The Fourth Generation of Progress. His graph of D2 receptor dissociation constants versus free neuroleptic in plasma water correlated well with antipsychotic dose provided a sound rationale for lower doses and also monitoring plasma levels of antipsychotics. In my experience the only people who need higher doses of antipsychotics are rapid metabolizers of a particular drug with lower than expected levels. With haloperidol that usually translates to a dose of 2-4 mg/day. That is consistent with the dose ranges in the diagram in Figure 2 of this paper. There is also a distinct group of people who have such neurotoxicity from antipsychotic medications that they should probably never take them. That is also why I am member of the Movement Disorder Society. Another interesting aspect of this paper is the psychopathology ratings. When I noticed the diagnostic heterogeneity and the likelihood of remission, the logical question is what the ratings show. In this study the Positive and Negative Syndrome Scale (PANSS). I had experience with the brief versions of these scales. Each dimension is rated on a 7 point Likert scale from 1 (normal) to 7 (extremely severe). The PANSS is widely accepted as being psychometrically valid. There is not a consensus on the interpretation of scoring and what might mean remission. In this study we have to track back to the original description of the sample (3) and we observe the average baseline PANSS P score as 9.9 for the DR groups and 10.7 for the MT group. The average PANSS N score was 13.1 for the DR group and 14.0 for the MT group. For the purpose of contrast, the authors of this article expressed their concern about the interpretation of PANSS scores illustrate their concern by presenting ratings for an agitated patient with schizophrenia and paranoia. The PANSS P score of 28 had improved to 24 by the end of the study and the PANSS N score was unchanged at 22. Although I could not find PANNS scores for the end of the second study, the scores in all categories across studies are strikingly similar. PANNS, BPRS, and CGI scores have recently been investigated by Leucht, et al who conclude that a change of a 10 point reduction of a PANSS score was the equivalent of mild clinical improvement and a 50% reduction was consistent with “much improvement” in an acutely ill non-refractory sample (5). 1. Mildly symptomatic populations with FEP may be cautiously tapered off low dose antipsychotics over time and experience better functional recovery. Tapering earlier in the course has a higher risk of relapse. 2. The treatment recommendation for low dose antipsychotic medication in mildly symptomatic populations is sound practice according to this report. Another important aspect is that minimal side effects were reported in standard measures in this study. It is still common to find patients discharged from hospitals on the equivalent of 10-20 mg haloperidol and show up for their first outpatient visit with metabolic or neurological side effects. 3. FEP needs further study. I suppose we can wait for a large initiative and I may have missed one in progress, but the best approach at this time would be for large clinics and hospital based programs to all develop FEP clinics staffed by interested staff and networked to share information. This study highlights that following the remission of psychotic symptoms is not enough and the common practice of following people in an outpatient “medication management” visit is not enough to restore functional capacity or quality of life. There is also the question of the availability of psychotherapy for people who can successfully taper off antipsychotic medications and for those who cannot. I have found that psychotherapy is often a useful treatment for people who cannot tolerate low dose antipsychotic medication. 4. The authors describe reasonable concerns about their study including that fact that they may have selected the “best half” of the subjects from the original trial. The subjects that were nonparticipants in the second study were described at “functioning at a lower level, less adherent to therapy and more difficult to engage.” But it is difficult to see that in the rankings at baseline. They also point out that the raters were not blind and suggest that probably would not account for the degree of difference. Based on studies of clinics that deal well with certain chronic disease (like cystic fibrosis) motivated clinicians with a stake in the treatment method and outcome clearly can make a difference and that might be reflected in ratings. They discuss a mechanism to account for gains in functional capacity in the DR arm and that is basically less impairment of dopamine signaling and possible impairment in drive, motivation and functional capacity. They recommend follow up studies of up to 7 years “or longer” in duration to look at these trends. Finally, there is really no reason why principles discovered in an FEP study or a psychotherapy study of psychosis cannot be applied to patients who have histories of recurrent psychotic episodes. Highly motivated clinicians can apply these treatment modalities if they have the opportunity. It is really no different than large scale (but much better funded) efforts in other specialties where the treatments and outcomes are in a state of flux. A good example would be electrophysiological ablation of atrial fibrillation. There has been some opinion about the implications of this study for the idea of life-long maintenance therapy but it is equally damning for the model of seeing patients in 15 minute visits and asking them about positive symptoms and medication side effects. There has always been a need for a much broader focus on cognition and functional capacity. Critical Period Following Remission From First-Episode Psychosis: Less Is More. JAMA Psychiatry. 2013 Jul 3. doi: 10.1001/jamapsychiatry.2013.264. [Epub ahead of print PubMed PMID: 23824206.
relapse rates and functional outcome. J Clin Psychiatry. 2007 May;68(5):654-61.
for schizophrenia. Schizophr Bull. 1987;13(2):261-76. PubMed PMID: 3616518. Oct;31(10):2318-25. Epub 2006 Jul 5. PubMed PMID: 16823384.